« Free Box.net 50GB Online Storage For iOS (iPad, iPhone & iPod) Users! 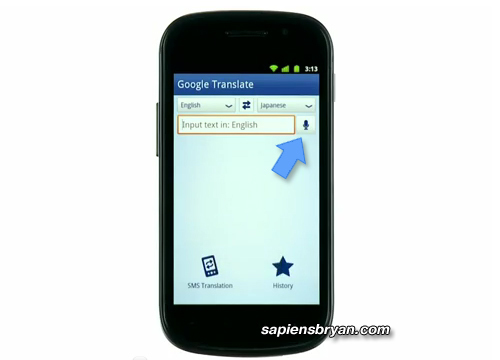 Google Mobile has released its latest Google Translate app for Android with a fascinating Conversation feature. The app is now able to translate spoken words into another language and speak the translated words back to the user. The Conversation mode currently supports 14 languages including English, Spanish, French, Italian, German, Portuguese, Dutch, Russian, Czech, Turkish, Chinese (Mandarin), Japanese, Korean, and Polish. It is for sure a dream app for a travel lover like me! It’s easy to use Google Translate in Conversation mode, just speak into your phone’s microphone and the app will translate what you’ve said and speak the translation out loud from the phone’s speaker. If there’s another person who is speaking the foreign language is beside you, the person can then reply in their language and Conversation Mode will translate what they said and read it back to you. Totally awesome! Google Translate app for Android is available for tablets and mobile phones running Android 2.2 and up, so head over to Android Market and download the latest Google Translate app. Below is another video showing the voice translation between English and French. While I’m feeling excited to try the Google Translate app on Android, I feel a little sad too because this Conversation feature is exactly the same as what I proposed to Nokia’s Make My App competition last Septemeber and won it. It’s so irony that I can use it on Android now. I personally had fun using Google Translate. :D because it is always word by word translating tool. Sometimes it felt so awkward to see the translation, i just get laugh with it. :) but still it was a good tool. Good thing also that the Android market had it. Thank you for posting this! I really had good time reading this.